Lisa Condit spoke with Colleen Furlan (AKA Jessicake) from “Shopkins Live! Shop it Up!” coming to The Hanover Theatre for the Performing Arts Friday, March 2. Read on for highlights from the interview, or listen to the full WCRN 830 AM radio interview below. Lisa: Can you explain what Shopkins is? And how you’re able to take this to our stage? Colleen: Shopkins is a line of toys and webisodes that comes from a company called Moose Entertainment, and they have created these adorable figures that are different types of vegetables or objects. And then there are characters called Shoppies. The story that we tell through the live musical takes place in Shopville, and all the Shopkins and the Shoppies are getting ready. There is a fashion show and we are all getting ready for the fair. The special guest goes missing, so we have to find them. It teams us together. It’s about how friendship is so important, and about how taking responsibility is a very big lesson. And there is pink and glitter scattered around. It is a beautiful show to watch. The brand is basically for kids from about 4 to 12 years old. But we’ve had adults come and see the show who are obsessed with Shopkins. It’s a show for everyone. It is so much fun. The music is amazing, and it’s all original pieces. Lisa: And very colorful sets and costumes. 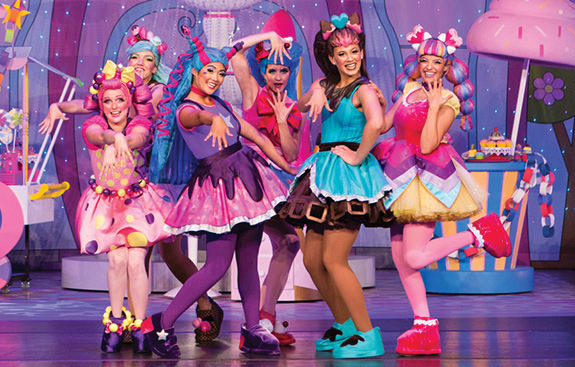 BUY TICKETS TO SHOPKINS LIVE! Lisa: Colleen, you are also a very serious and talented actor. You haven’t always played Jessicake. Can you talk about your journey? Colleen: I am actually a Canadian actress, so this is my first time touring around the states. I have a music degree, and I was on a reality TV show in Canada for musical theater, and I had the amazing fortune of playing Ariel in “The Little Mermaid” in the Canadian premiere, which was one of my favorite roles that I’ve played. I normally do the Broadway musicals. I’ve never really done a children’s show before, so getting this North American tour as the lead was very exciting, and I’ve learned so much performing for a different audience. I feel like a rock star for children. My favorite thing is seeing the children react to the characters that come on stage. They cheer. We love it, and it feeds our energy. Their reactions are amazing, and then watching their parents and seeing how happy they are having their kids this happy. It is very moving to me. It is a beautiful show and really, really fun! What is your child’s favorite “Shopkins” character? This entry was posted in Behind the Scenes on WCRN Radio, Family-Friendly Shows, Upcoming Shows. Bookmark the permalink.